I always want a motorcycle for its freedom and excitement. Financial responsibility has held me back from getting one until now. I was glad that I waited anyway. 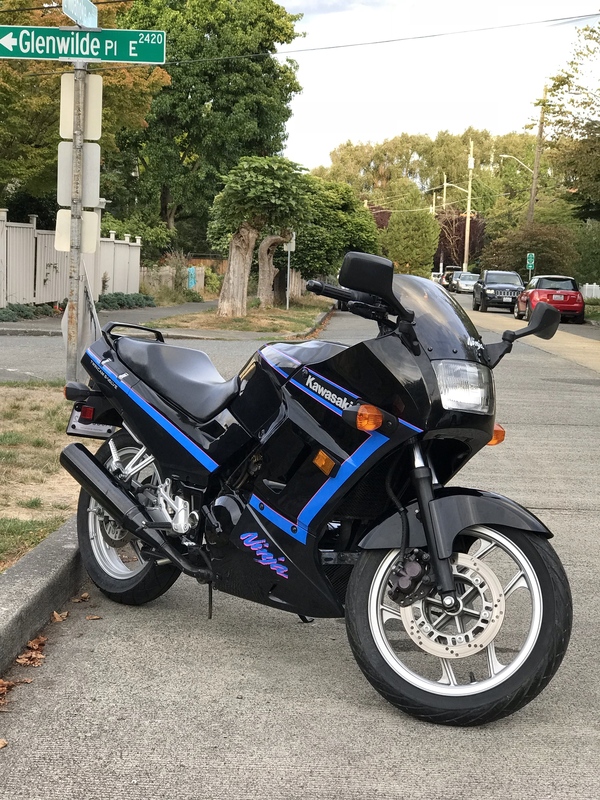 Now that I’m in my mid-20s, I can comfortably own my first motorcycle with disposable incomes and don’t have to cheap out on gears. In fact, I took a MSF class and bought all the gears prior to even shopping for a motorcycle, so that I wouldn’t blow all my money on the bike first. She’s a beauty. I might get bored of the small engine, but hey, I got it for $1,200 plus tax, and I can probably sell it for close to the same. Or I’ll just keep it till it dies. P.s. sorry about the large image. The bbcode I used doesn’t seem to resize it. That's awesome. Beautiful bike in great shape. You won't get bored if you learn how to really work the bike. Lugging around at 5-6000 rpm... yeah, yawn. Wind it up and it'll be a hoot. The bike comes alive at high RPM. But first things first. Get some seat time and have fun learning how to ride. It'll be a great adventure! Ugh. I am definitely in the yawn zone at the moment. Being a boring stick shift car owner means I keep shifting up at 3,000 rpm. Before I get more seat time, I need to do a couple maintenance first. First, I must replace the horn. It’s as loud as a stalled engine. It’s not the fuse nor the switch, so it must be the horn unit itself. Any 12v horn will work, I suppose? I should just do the math and see what power the fuse can support this weekend. Then, I’ll probably drain all fluid and replace them with new ones. Change the break lines with stainless ones while I’m there too, I guess. Hi and welcome! Nice bike, you're gonna have loads of fun! Don't use low RPMs due to lower oil-pressure, it'll cause more wear. It is really a great thing when a dream comes true. Treat the bike well and it will take good care of you. This is a classic bike. So timeless they did not change much for twenty years. That says a lot. Everybody tells me I "need" to get a bigger bike, but going on three years so far, and I'm quite happy with the Ninjette! And yeah, once you start riding her, wind her up! I started on a 600, and keep picking up little 250's because they are so dang fun! Be sure to keep up on the maintenance, Feed it good sticky tires, and it will keep you entertained for a LONG time. Ah. The resize tag will certainly come handy in the future. And thanks for the low oil pressure tip. I have to read up more about it. I really like how clean the bike looks. Plain black with a touch of blue without screaming at my face. The lack of chrome parts is definitely a plus. I tell myself losing a few pounds on me probably makes a difference on speed already. Ugh. I got this from I-90 at Issaquah. And yours? It sounds like you have quite a collection! I traded a bike into i-90, and have bought a bunch of gear there. Pretty nice place. All my current bike are private sales. The 250 was actually walking distance from home!